If the way I spent my last 2 days of 06 has any indication of how 07 is going to be then this is going to be one soul train moving, beer pong playing, girlfriends dancing, boyfriend kissing year! The wedding was fabulous. My college friend got married in gorgeous Assumption church in St. Paul, MN. It was a night wedding which gave it that Christmas Midnight mass feeling. Afterwards we were happily entertained at the reception with great music, all you can drink wine and beer, and or course the beautiful bride and husband. There was much dancing too! What wedding is complete without a hilarious session of Soul Train. Complete with bowlers, robots and booty shakers? New Years Eve was spent partying "college" style at my generous friend Emily’s house. 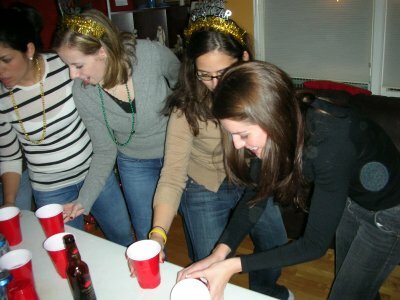 We played rounds of Flip Cup (aka Tippy Cup for all you midwesterners) and Beer Pong. We watched the clock as most of us Eastcoasters celebrated two "ball drops". One spent on various mobile phones with boyfriends making wishes of love and "wish you were here" sentiments. The other hugging and kissing each other and jumping about. 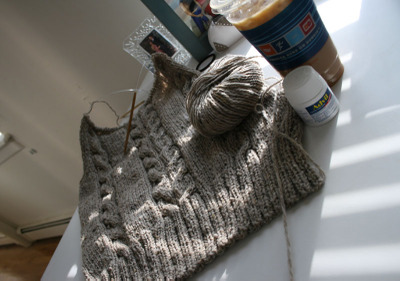 Woven into this weekend was knitting CP. It sat with me waiting for my flight at the aiport. On my plane (which on both flights I was stopped by the airline attendant and asked about it! One even was working on a sock herself and brought it out to me because she had a question! ), waiting in the hotel room for everyone to get ready, laying low on Sunday before the big New Years eve party, and again on my flight home. I am happy to be home taking this personal day before heading to work tomorrow. I got to spend last night enjoying the 1st day of the year with my boyfriend. Lazily in bed we watched Bowl Games (Go Boise State Crocheter!!) and a bit of the Heroes marathon. I have many resolutions for 07, mostly to be happy with who I am and what I do. (yes, eating right and working out are in there too). Cheers to a new year of knitting, blogging, making friends and new wonderful memories! CPH is looking great! I’m so jealous – the yarn I was going to use for it didn’t work out so I ordered new yarn. Of course no mail for three days makes Cara a cranky knitter. We will DEFINITELY hang in the new year. Let me know what you’re working at Patricia’s again. I’ll try to come by and knit with you. Do you only work there on the weekends? I’m glad you had a good new year’s eve! The hoodie looks great, too.